Santa Rosa society, prepare yourselves for nonstop supper parties, elegant receptions and high teas: Anna May Bell is coming to town, and she's engaged to be married. Miss Bell lived in Southern California, but spent her summers here as a guest of Mattie and James Wyatt Oates, to whom she was something of a godchild. The parties given in her honor were always the most talked-about of the season; three hundred attended a 1905 reception at the Paxton home, just two doors down from the Oates. And despite the somber mood of the town in the months following the 1906 earthquake, Anna May's appearance that year inspired the first parties since the disaster. But something was in the winds come 1907; she didn't visit Santa Rosa at all. Instead, the Oates family spent Christmas and New Years' at her home in Visalia. Then in the summer of 1908 came the announcement - she was to marry Samuel Cary Dunlap, a Los Angeles grain dealer. The Oates and her other friends were delighted at the news, and although her 1908 visit lasted less than three weeks, at least four five events were held for her, including the largest party probably ever held at (what would become known as) Comstock House, where two hundred guests filled the rooms. A small orchestra fiddled away, presumably behind potted palms in the library, as had been the entertainment at an earlier party. The wedding that October received full coverage in the Santa Rosa papers, even though it was held in Anna May's hometown of Visalia. A local woman was a bridesmaid, traveling with the Oates to the event. But at the last minute, Wyatt bowed out of attending the ceremony, staying home because of the "press of business matters just at this time." What was important enough to have kept him here is a mystery. Nothing in the papers around this time suggested that he had critical legal business before a court or that he was closing a big deal. (One possibility is that he was needed to intercede on behalf of the local electric company, which had the town spitting mad over recent power outages; Oates had represented the company a year earlier when they obtained a franchise from the county. See following post for more on the town's "juice" problem that year.) But when it comes to James Wyatt Oates, it's easy to always assume the worst - that he refused to go because some incident incited him into a fit of pique, or that he couldn't bear to be separated from his first automobile, which had just been delivered a couple of weeks before. Whatever his reason for not attending her wedding, Wyatt and Anna May maintained close ties until the end of his life. She was at his deathbed as he died of double pneumonia, following a visit to her home in Los Angeles. The marriage of Samuel and Anna May Dunlap lasted over two decades, ending when he died at the age of 64 (he was twelve years older than she). They had one child. 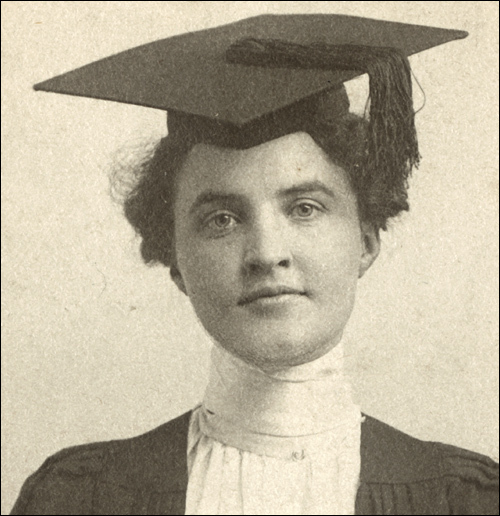 Anna May did not remarry, and apparently did not return to academics, although as a 1900 Stanford graduate, she had taught English at the Los Angeles Polytechnic High School. During WWII, she had leadership roles in several Los Angeles war-relief women's groups, including Bundles for America, the Committee for Navy Reserve, the War Finance Committee. of Southern California, and more. She was also the state president of the United Daughters of the Confederacy, being the grandchild of Gen. Tyree Harris Bell, C.S.A. Anna May Bell Dunlap died on June 14, 1967, ninety years old. Her last appearance in the Santa Rosa newspapers occurred in 1950, when she returned to town to make a donation to the library and commissioned a local student to design a bookplate to be pasted in the books purchased through her grant. The gift was made to the memory of James Wyatt Oates. Colonel J. W. Oates, who has been visiting with his wife in Visalia and Fresno for a couple of weeks, returned home last night. Mrs. Oates will remain for a longer visit in Fresno. Mrs. James W. Oates and Mrs. M. S. Solomon have returned from their visit in Visalia and Fresno. Accompanied by Colonel Oates the ladies went south on December 22. Colonel Oates returned several days ago, and Mrs. Oates and Mrs. Solomon came home Tuesday. The Los Angeles papers have announced the coming marriage of Miss Anna May Bell in that city. Miss Bell has often visited Mr. and Mrs. J. W. Oates at their home in Santa Rosa and has made many friends here. The groom-elect is Samuel Dunlap, a grain merchant of Los Angeles. Miss Bell is a charming and delightful girl, who has visited in the City of Roses frequently, and she is popular here in social circles. She is handsome and vivacious and her many friends here will learn with pleasure of her the approaching nuptials. During her visits here Miss Bell has always been the object of great attentions, and many parties were arranged in her honor. She is a decided favorite here with a large number friends. Judge James W. Oates and Captain I. T. Bell, the latter of Visalia, left here Friday morning for Guerneville and Monte Rio, and from there they expected to go to Cazadero for the day. On their return they think of coming by way of Occidental and across the electric road at Taylor's and thus make a complete circuit of the western Sonoma County. Captain Bell is very much elated over the county and climate, and remarked before taking the train that they enjoyed 35 days at this his home this summer during which the temperature registered 110 or over. Colonel and Mrs. J. W. Oates are entertaining Captain Bell, of Visalia, the father of Miss Anna May Bell. Colonel Oates and Captain Bell have enjoyed a couple of days in touring the beauty spots to be found at Guernewood [sic], Camp Vacation, Bohemian Grove, Armstrong Grove, Montrio [sic] and other places. Captain Bell is delighted with the City of Roses and Sonoma County. On Friday evening, August 21, Colonel and Mrs. James W. Oates will entertain at their beautiful home on Mendocino Avenue, in honor of two fair brides-to-be, Miss Anna May Bell, daughter of Captain Bell of Visalia, and the Miss Irma Woodward, daughter of Senator and Mrs. E. F. Woodward. Colonel and Mrs. Oates have issued cards for a reception from eight until eleven o'clock on the evening named. It is sure to be a very delightful event. A society event of this week which is anticipated with much interest by those receiving invitations to be present occurs on Friday night at the handsome colonial residence of Colonel and Mrs. James Wyatt Oates on Mendocino Avenue. On that evening they will be "At Home" in honor of two charming girls whose engagements were recently announced. Miss Anna May Bell, daughter of Captain and Mrs. Bell of Visalia, and Miss Irma Woodward, daughter of Senator and Mrs. Edward F. Woodward. Both Miss Bell and Miss Woodward are very popular here and deservedly so,. The host and hostess of the occasion are always delightful entertainers, and in consequence their guests know that neither nothing will be wanting that can in any way enhance the pleasure of the evening. Miss Anna May Bell has arrived here from Visalia, and is a guest at the home of Colonel and Mrs. James W. Oates, arrived here last night for a visit with Colonel and Mrs. Oates. At the beautiful Paxton home on Mendocino Avenue on Wednesday afternoon Mrs. Blitz W. Paxton and her mother, Mrs. Mary Marshall, were the hostesses at a tea which was attended by a large company of their lady friends. The parlors were beautifully decorated for the occasion, and the ladies entertained in a very charming manner. Miss Anna May Bell of Visalia, and Miss Ellie Holmes of San Francisco, two very popular young ladies who are visiting Santa Rosa, where the motif for the delightful function. An interesting quartet composed of two prospective brides and grooms-to-be was the center of attraction at the delightful "at home" given by Judge and Mrs. J. W. Oates at their residence Friday evening. It was a recepion to Miss Irma Woodward of this city, who will sortly become Mrs. J. Allen Wallis, and Miss Anna May Bell of Visalia, whose title is soon to be Mrs. Samuel Cary Dunlap. Fully 200 guests thronged the beautiful flower-decorated rooms during the evening, meeting and congratulating the two brides and the future partners. Judge and Mrs. Oates are the most hospitable hosts, and when entertaining neglect nothing that will added to the enjoyment of their guests. During the three hours of the reception an orchestra discoursed exquisite music, a pleasurable feature of the occasion. Throughout the supper hour a number of young ladies waited in serving in the assisted in the serving. Reception at the beautiful home of Colonel and Mrs. James W. Oates on Mendocino Avenue last night was a brilliant social function. It was in honor of Miss Anna May Bell of Visalia, and Miss Irma Woodward of this city, two very popular brides-to-be. Two hundred invited guests had the pleasure of formally tending very hearty congratulations to them and their prospective husbands, Mr. Dunlap, who is to wed Miss Bell, and Mr. Wallis who is to claim Miss Woodward as bride. The scene in this richly furnished reception rooms, enhanced with exquisite floral arrangements, was a captivating one, and from eight until eleven the happy throng of guests mingled. The hospitality of the Oates home was never more graciously extended than on this occasion. The minutest to detail that could add in any way to the pleasure of the evening were not overlooked and the host and hostess were highly complemented. Naturally attention was centered upon the young ladies in whose honor the reception was given and they in turn were most cordial in their acknowledgement of the good wishes extended. An elaborate supper was served in the dining room and a number of young ladies assisted in serving the refreshments. It was indeed an auspicious occasion in every way. Mr. and Mrs. Edward F Woodward gave a very delightful launch party on San Francisco Bay on Sunday in honor of their daughter, Miss Irma Woodward and Miss Anna May Bell, both brides-to-be. Fifty of their friends from the city and a number of young people from Berkeley were invited guests. At Tiburon the party embarked on the government launch "Golden Gate," and first went out o the Heads and inspected Uncle Sam's battleships of the Pacific squadron. The cruiser Pennsylvania was boarded and the party conducted over the big vessel. Goat Island was visited and the naval training school inspected. The visitors were in time to see one hundred young, sturdy lads pack up and start for the Pennsylvania for the purpose of entering active service in the Navy. Angel Island and the immigration inspection quarters were also visited. Aboard the "Golden Gate," Mr. and Mrs. Woodward entertained their guests at luncheon, and in every way the cruise on the Bay was very pleasant and entertaining. Mr. and Mrs. Woodward were cordially thanked by their guests. Mrs. Henrietta A. Hahman entertained two charming brides-to-be at her handsome home on Third street Tuesday evening. Miss Irma Woodward of this city and Miss Anna May Bell of Visalia were the guests of honor, and many were present at the reception. Cards formed the principal feature of entertainment, five hundred being played during the evening. Mrs. C. A. Wright was successful in capturing the ladies' first prize, and Miss Bell took second honors. The gents' prizes went to J. Allan Wallis and Miss Alma Keser, while Miss Woodward secured the slam prize and Mrs. Charles F. Rohrer got the consolation prize. The Hahman residence was handsomely adorned, a pretty decorative scheme being shown, and the card games took place in a veritable floral bower. The Misses Hahman assisted their mother in entertaining, and Miss Clara Hahman rendered a number of vocal selections during the evening. Following a delicious tete-a-tete supper, served at midnight, a social season followed, and the guests departed for the homes at an early hour Wednesday morning. One of the most elaborate functions of the season was the luncheon in honor of Miss Anna May Bell, given by Mrs. John S. Taylor and Mrs. Zana Taylor, on Wednesday at the beautiful Taylor residence on Mendocino Avenue. The decoration scene was carried out with exquisite taste. Pink and white were the prevailing colors, and white and pink roses and pink amaryllis the flowers used. It was a progressive luncheon. In the dining room, where the decorations were in white, five tempting courses were served, while for the desert and confections the guests moved to another room, all in pink. Covers were laid for a dozen guests. The name cards were decidedly unique. They were of "bride" design included a dainty little bride's veil. A toast to the bride-to-be, Miss Bell was heartily proposed by the guests and some very pretty sentiments were voiced as the handsome loving cup was handed around the table. The cup was handpainted, displaying Miss Taylor's handiwork. The loving cup was presented to Miss Bell as a souvenir of the occasion. It was a very happy occasion for all present and one that will be fraught with many pleasant memories. Miss Anna May Bell departed of the first of the week for her home in Visalia after a visit here with Colonel and Mrs. James Wyatt Oates, during which she was certain made much of in view of her approaching marriage. Her visit on this occasion served to cement more firmly the ties of friendship that exist between herself and a large coterie of friends in the City of Roses. She is a very charming girl and her great popularity is deserved. Miss Anna May Bell is to become a bride on October 20 and Miss Irma Woodward will be the bridesmaid at the wedding. This is certainly very nice in view of the large number of joint social functions at which these two popular girls were entertained in the City of Roses. Mrs. James Wyatt Oates and her mother Mrs. Solomon, and Miss Irma Woodward, left yesterday morning for Visalia, where they will attend the wedding of Miss Anna May Bell, which takes place this evening at eight o'clock. Miss Woodward is to be the bridesmaid for Miss Bell. Mrs. Oates and Miss Woodward will return home Saturday but Mrs. Solomon is to remain in Visalia for couple of weeks. Colonel J. W. Oates was prevented from going to the wedding on account of press of business matters just at this time. Miss Anna May Bell, one of Visalia's most popular young women, was wedded at the M. E. Church South last night to Samuel C. Dunlap of Los Angeles. Rev. J. E. Moore of Fresno officiating. It was a brilliant affair. The bridesmaids were Miss Irma Woodward of Santa Rosa, Msiss Myrtle Harrell of Fresno, and the maid of honor Miss Eva Gray of Los Angeles. The ushers were Messrs. S. S. Stitt, L. H. Allen and G. H. Schneider of Los Angeles. 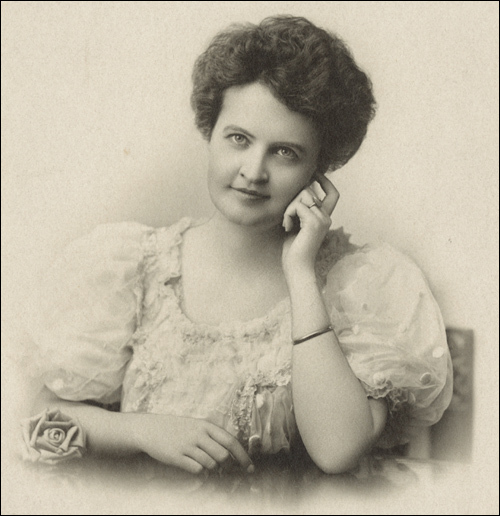 Mrs. H. G. Parish and Mrs. H. H. Holley rendered "Oh, Promise Me," on piano and violin. The bride was attired in a dainty imported dress of messaline with point lace trimmings and carried a large bouquet of lilies of the valley. The matron of honor, Mrs. Connick of San Francisco, herself a bride of a few weeks, was attired in a gown of lace. The bridesmaids wore directoire gowns of yellow satin, and carried yellow chrysanthemums. Following the ceremony the relatives and out-of-town guests repaired to the Bell residents where a collation was served and a reception was held until 11 o'clock, and the newly-married couple left for Tulare by auto and took the Owl for Los Angeles, where they will make their home. The church decorations, which were arranged by Miss Kate Parsons and Miss Myrtle Harrell of Fresno, were among the most elaborate seen in Visalia in some time. Colonel and Mrs. Oates and other Santa Rosa friends have received a number of letters from Mrs. Dunlap (Anna May Bell). Mrs. Dunlap always likes to be pleasantly remembered to her large circle of friends in the City of Roses. Mr. and Mrs. Dunlap are now at home to their friends in an attractive residence in Los Angeles.